A sunflower can easily stand out in a garden due to its height. Many reach the height of a grown adult easily over a few months. Others may only reach a few feet, such as the hybrid dwarf species. They are used for many purposes, such as a source of cooking oil. The seeds are a favorite for trail mixes or as a bird and animal seed. They are also used in floral arrangements or as a single cut stem. e. The Teddy Bear variety is named because its flowers appear fuzzy. The bright thick clustered blooms often resemble a teddy bear's fur. These flowers are often softer than other varieties of the species. The coconut ice hybrid offers the size and splendor in a new color. Creamy white petals are the hallmark of this popular annual species. A vivid black center makes for a dramatic statement against the white. Chianti hybrids offer deep reddish blooms with a dark center eye. Other hybrids may include several dwarf or double flower varieties. Flecks of color may be present in some species for a better bloom. Sunflower cultivation and gardening has many options for gardeners. The traditional height is often a factor when planning planting. The high demands for maximum sunlight are another factor to consider. On average, sunflowers need six to eight hours per day of sunlight. This should be ideally direct light to achieve the best growth. Some varieties may tolerate less sunlight or do well in partial sun. Many dwarf species can be planted in containers or window boxes. Several of these grow between 18" and 3' tall, making them shorter. They may also be used as edging for a garden bed or lining a path. Many soil types are suitable for growing sunflowers in a garden. For optimal growth, well drained and enriched soil should be used. Soil that is primarily clay may require nutrients added to it. Sunflowers are a common staple for both culinary and manufacturing. The most popular use is with the seeds, which are dried and eaten. The seeds may be roasted and salted or served plain or flavored. Seeds are high in nutrients, making them a popular snack or treat. They are often added to salads to add a crunchy and nutty flavor. Seeds are also used for bird feed for both domestic and wild birds. The oil is often used for cooking as well as an additive to products. The light taste and appearance makes it a popular choice for cooking. It is common to see it added to cosmetics and skin care products. Extracts and oils may also be used to create perfumes from sunflowers. The light and airy fragrance makes it a popular spring perfume. It may also be used in home fragrance products or cleaning goods. A large bloom is a popular choice for a sunny get well present. Sunflowers have long been associated with happiness and cheerfulness. Loyalty and longevity are other common symbols for this bright flower. Small species may be used to create bouquets of tight packed flowers. These are often used for a centerpiece or a flowering gift basket. Small flower heads can also be worn in the hair or on a jacket. Large blooms are sometimes given alone or with other plant species. Once the petals dry and fall off, the seeds can be dried and eaten. 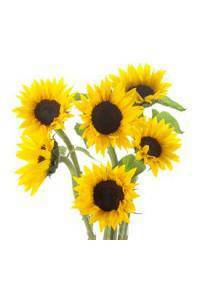 This makes a sunflower a popular and versatile gift for anyone.